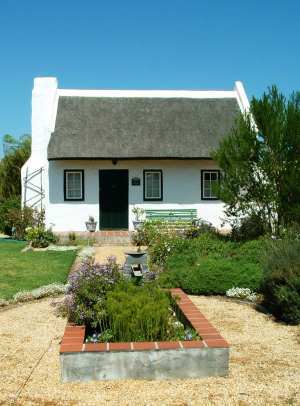 Delightful thatch-roofed Stanford accommodation cottage in a picturesque English country garden with beautiful views of the Klein River Mountains and historic market square. Open-plan living with huge fireplace and loft sleeping area. Fully equipped with self-catering kitchen, linen and towels, shower, parking and sheltered outside braai area. TV with Compact bouquet DSTV. Double bed in upstairs loft. Children and pets welcome. 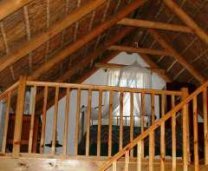 Ideally situated for whale watching in Walker Bay and shark cage diving in Gansbaai and as an alternative to Hermanus accommodation. *Minimum stay of 2 nights during weekends, and 3 nights during long weekends. Min 5 days over Christmas/New Year. Regret no credit card facility. Rates are in South African Rand (ZAR). Currency conversions at xe.com. ... or contact us regarding Stanford accommodation. 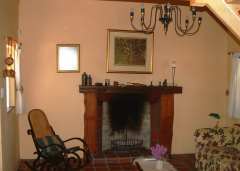 B's Cottage is situated at 17 Morton Street, Stanford, Western Cape, South Africa. Take the N2 from Cape Town and at Botriver turn onto the R43 to Hermanus. Drive through Hermanus on the Stanford/Gansbaai road R43. Some 20km outside Hermanus, at the Caltex Garage (filling station), turn right into Stanford's main road Queen Victoria Street. At the first stop sign turn left (Langmark Street) past the market square on your right one block to the next stop sign. Turn right into Morton Street (the old Anglican Church is on the right hand corner). Turn left at the third property in Morton Street, number 17. 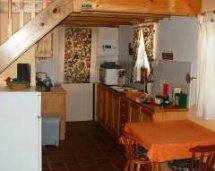 B's Cottage is the smaller of the two accommodation units on the property. Take the N2 to Cape Town. 15km outside Riviersonderend turn left on the R326 to Stanford South Africa. The R326 eventually goes straight into Stanford's main road Queen Victoria Street. At the first stop sign in Queen Victoria Street turn left (Langmark Street) past the market square on your right one block to the next stop sign. Turn right into Morton Street (the old Anglican Church is on the right hand corner). Turn left at the third property in Morton Street, number 17. B's Cottage is the smaller of the two Stanford accommodation houses on the property.